BOARDMAN, Ohio – The picture of a staff meeting on a brochure for the Mayo & Orvets real estate firm in the 1960s resembles a scene from “Mad Men” – 10 white males in suits and ties with well maintained haircuts, all smiling as they talk with each other or on rotary phones. When asked if there were scotch and cigarettes, Richard O’Brien affirms the latter with a laugh. Things have changed dramatically since the early 1980s when O’Brien and co-principal and broker, John McCarthy, joined the firm that would become Mayo Realtors. Smoking is out and women make up 63% of agents, according to the National Association of Realtors. Smartphones replaced rotary phones and pagers, computers do more than word processing and dot-matrix printers are antiques, and home guides are little more than nostalgic keepsakes. The issue was delivered every two weeks to the office and agents would immediately pore through it to find listings. Otherwise, they would drive around the neighborhoods looking for yard signs. Websites such as MLS.com and Zillow.com have changed that. “Right now, if a new listing comes on the market, it will hit my phone within a second of them putting it on the internet,” McCarthy says. Innovation was something that John “Jack” Mayo championed when he founded the agency with Leonard “Len” Orvets in 1959. Mayo and Orvets introduced larger yard signs for listed houses and the practice of open houses, something the agency incorporates in its sales strategy to this day, O’Brien says. “They were innovators. Real estate today was a direct result of Jack and Len back then,” he says. After graduating from The Rayen School in 1942, Mayo joined the U.S. Marine Corps and earned the rank of second lieutenant. He graduated from the University of Notre Dame, where he was captain of its baseball team, and was drafted by the Philadelphia Phillies where he played from 1947 to 1956, including the 1950 World Series against the New York Yankees. 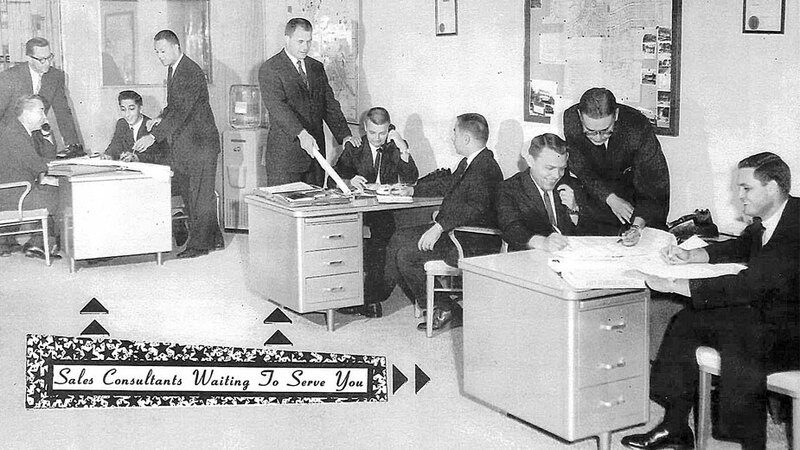 Mayo and Orvets opened its first office at 5020 Market St.
A brochure for Mayo & Orvets in the 1960s featured a snapshot of the office at 5020 Market St. Business was conducted by men, and by rotary phone. In 1966, as the General Motors Lordstown Complex began to ramp up and create thousands of new jobs in the area, increased demand for housing and a lack of new construction created a market for Mayo and Orvets to capitalize on. The agency “led a good section of the area” with new construction, McCarthy says. Those neighborhoods include Applewood Acres, Tanglewood, Mount Vernon and Park Harbour, which now boast more than 2,500 houses. After building the residential communities, Mayo turned his attention to commercial development, McCarthy says. In the last 25 years that Mayo was with the agency, he developed more than 280,000 square feet of commercial property, including the Tiffany Square Plaza and Tiffany Plaza II along U.S. Route 224, as well as some developments in Austintown. The Mayo family has managed the commercial properties since Jack Mayo’s death in August 2014, McCarthy says. He and O’Brien – Mayo’s sons-in-law – took over the residential side of the agency in the mid-1990s, adapting to new technology and grooming younger agents for their careers. Earlier this year, the agency moved to its third office in 60 years at 1419 Boardman-Canfield Road in Boardman. The new location includes a technology-training center where McCarthy and O’Brien conduct training sessions for their new agents using a smart TV, as well as webinars and guest-speaker sessions for their 15 full-time agents, six of whom have been there 20-plus years. It’s quite different from how training was done in the 1960s when rookie agents listened to “Successful Real Estate Selling” by Cliff W. Krueger on a vinyl record. Today, agents are trained to use modern technology, such as social networks to communicate with customers, multiple listing systems and how to set up their web pages to generate leads and market themselves, O’Brien says. The agency also sends agents to continuing education classes. New hires shadow experienced agents during open houses and listing presentations to get experience, McCarthy notes. Twice monthly, the agency hosts an internet training update via a webinar that features a national speaker, such as an inspector, lender or appraiser. “Education and training seems to be an everyday event in this changing industry,” McCarthy says. While some argue technology such as social media takes away from personal connection, McCarthy and O’Brien argue just the opposite. They see younger agents using live video streaming, such as Facebook Live and FaceTime, to connect with customers and provide live tours of houses. Smartphones and tablets have made processing paperwork more efficient as well, they say. The Dotloop real estate management platform handles the entire process, from electronically sending contracts to customers, who initial them via electronic signature and send them back to Mayo, who sends them to the bank. “The ability to write a deal and literally have it sent to the buyer or seller for a signature within seconds is here and now,” McCarthy says. Which is a benefit, considering a purchase agreement can be anywhere from 10 to 20 pages, up from a few paragraphs on one side of a sheet of paper in the 1950s and ’60s. “It’s probably gone up sixfold,” O’Brien says. Keeping the customers informed also helps the agent, he says. Before the internet, agents had to drive customers to 10 to 20 houses to shop around. Today, customers browse houses online and call Mayo with the two or three they want to see. Agents coach the customers on pros and cons of each house, which requires extensive knowledge of the properties as well as the neighborhoods, he says. They also direct the customer through the inspection, lending and appraisal. Agents who are more adept at posting pictures online typically sell their listings faster, O’Brien notes, and the selling price is closer to the list price. Even with technological advances, they say being an agent remains a 24-hour job, something that Mayo taught them and they pass on to new agents. In the current market, customers can’t take too long to narrow their choices, the agents say. Historically low interest rates, coupled with scant inventory, have created a market in the last four to five years that neither has seen before. The market is still missing new construction, McCarthy notes, which has created an imbalance between demand and inventory. However, he says it’s starting to pick up and loosen and inventory rates are beginning to climb. Business at Mayo is about 12% ahead of the same period last year, McCarthy says, and a mild winter means the buying season is starting earlier. Looking ahead to the next 60 years, McCarthy and O’Brien say Mayo Realtors will honor and practice lessons learned from its founder and remain an independently owned agency. Pictured: Flanked by a smart TV, Mayo Realtors co-principals John McCarthy and Richard O’Brien display a few relics.